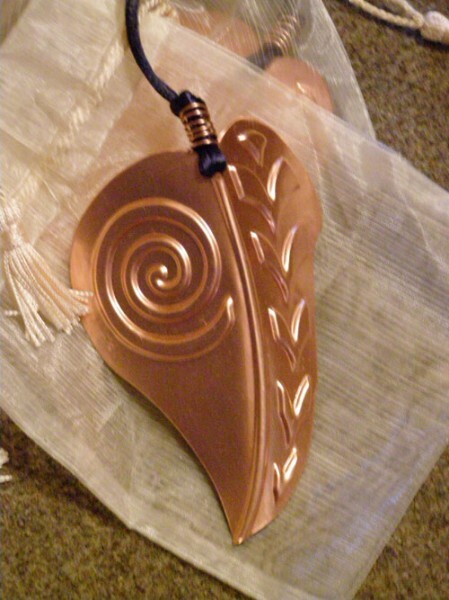 This lovely, polished and sealed copper leaf is exactly like those on the real Hope Tree sculpture in St. Helena, CA. They are individually made with custom hand presses from 10 gauge copper sheeting so no two are alike. Since they are sealed with an acrylic coating they will never tarnish. They measure 3 1/2" long by 2 1/2" wide. 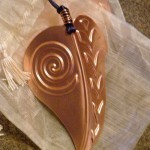 They have a hand-spiraled copper wire clasp at the top knot with a 3 1/2" long round satin cord - making it perfect for hanging in a special place where you can see it every day. It comes in a lovely box with a note telling the story of the leaf design as it relates to the Hope Tree. The perfect gift for someone in need of encouragement and hope.